Free parking for clients, free Wifi and barrier-free access is standart for our hotel. Free parking area in the private courtyard of hotel. 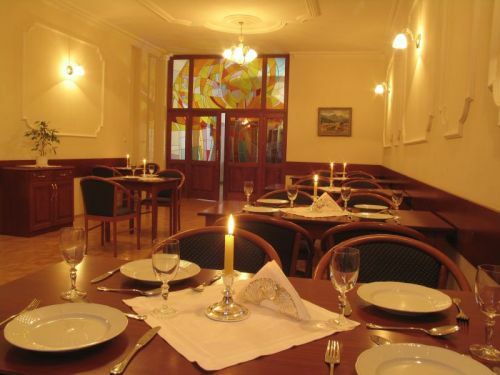 Hotel U Leva is an only disabled friendly hotel in Levoca with a barrier-free access. There is a lift (elevator) and room for disabled available. There is a free internet access. Seminar roomA conference room for 30 - 50 people is provided by WiFi HotSpot. It´s a perfect place for education seminars, firm meetings, family reunions. A private room has capacity 12 chairs. Excellent restaurant has capacity of 48 chairs. The hotel has fitness and sauna facilities. You can relax in fitness centre with sauna and massage. You can use also laundry service , souvenir shop, pharmacy. Are you looking for accommodation in the Levoča center ?